As the stage lights dim and applause erupts I sit in absolute awe at the performance I’ve just witnessed. I believe puppeteer David Simpich is truly a creative genius. His masterful interaction with a cast of marionettes amazes whether he’s relating the Christmas story or a Russian fairy tale. For nearly an hour and a half I’ve been mesmerized by a seamless one-man show. Simpich, and only Simpich, is on stage with more than a dozen marionettes, speaking for each in a distinctive voice, he’s the sound effects, lighting technician, props man and stage manager. Not only that, he’s also the playwright, puppet creator, costumer and stage designer. Amazing! Simpich skillfully brings the marionettes to life; his large hands deftly execute the slight tilt of a head or turn of a tiny hand. Although we can see his mouth moving it’s the character speaking. These minute nuances make us soon forget we’re seeing puppets controlled with a multitude of strings. The audience is completely drawn into the magic of the story and presentation. After years of traveling and producing shows around the country Simpich, along with wife, children and family of hundreds of handcrafted puppets has a permanent home in Old Colorado City, Colorado Springs. 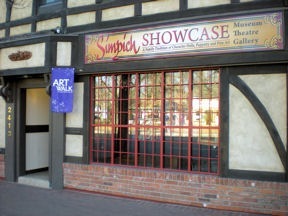 Simpich remodeled the former home of his parent’s Simpich Dolls company, opening the Simpich Showcase Museum, Theatre and Gallery in May 2009. The handmade character dolls created by Jan and Bob Simpich are beloved by collectors around the world. For 54 years the workshop hummed with up to 100 workers intricately detailing each creation. Jan and Bob closed their business in 2007. The Simpich Doll Museum showcases the creative process as well as dioramas of many characters from the family collection. The Gallery on Strings displays dozens of David Simpich’s marionettes, allowing close inspection of the finely detailed puppets. An exhibition of Bob Simpich’s original oil paintings are currently highlighted in the Gallery. Originals and prints are available for purchase as well as works by Jan Simpich and selected artists from the Colorado Springs area. The 70 seat theatre is a rare facility dedicated to string-puppet productions. The size and design allow for a intimate audience experience. The Firebird, an original retelling of classic fairy tales from Russia opened January 27, 2010. The show continues through March 21st with performances each Friday evening and matinees on Wednesdays, Saturdays and Sundays (no show Sunday, February 7th). Simpich shows are crafted for an adult and school-age audience. The length and content make them unsuitable for pre-school children. These are not cutsy kiddie shows but thought provoking, quality theatre drama productions. Four other shows are planned for 2010. Tickets are available for individual performances or in season ticket packages for all five at a discounted rate. Shows frequently sell out – especially the Christmas Carol – reservations are strongly advised and can be made at the Simpich website. Theatre tickets include admission to the museum. The Gallery and Museum are open daily except Monday. After seeing a You Tube video about Portraits we’re planning our next visit. Attend a Simpich show and be entertained, amazed and inspired. Let me know your reaction. This would be a most marvelous program for our Kiwanis. Perhaps we could take a visit to your museum and have a sample play. You have an Amazing gift! Contact David Simpich at 719-465-2492. He is an amazing talent! I took my grandkids and son to the Christmas Carol yesterday and I was enchanted. Thank you for a completely unexpected performance that left me looking forward to bringing my family to the next one.